Large Mounted Albumen Photo, 8-1/2” x 1-1/2” ID’d on the front mount “CODY”. Remarkable image of a young S.F. Cody and two his two standing behind a bicycle built for three. np., c1890. Samuel Franklin Cowdery (later known as Samuel Franklin Cody; 6 March 1867 – 7 August 1913, born Davenport, Iowawas a Wild West showman and early pioneer of manned flight. He is most famous for his work on the large kites known as Cody War-Kites, that were used by the British in World War I as a smaller alternative to balloons for artillery spotting. He was also the first man to fly an aeroplane in Britain, on 16 October 1908. 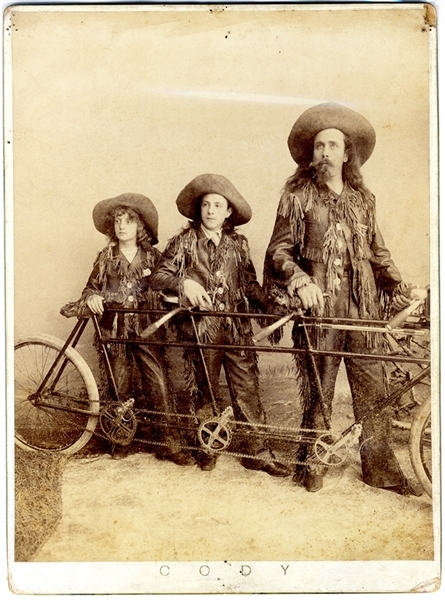 A flamboyant showman, he was often confused with Buffalo Bill Cody, whose surname he took when young.